Ron Moore's reimagined Battlestar Galactica series has been a hit with sci-fi fans for over a decade. As with any series that takes place in space, the ships are just as important as any of the characters. The Cylon Raiders seen in this series are interesting because the ships are characters! Rather than being piloted by humanoid shaped Cylons, as seen in the 1970's series, the new Raiders are, themselves, Cylons. The 1/32 scale Raider offered by Moebius has been very popular with modelers over the last couple of years, and now, Moebius is offering a 2-pack of these ships in 1/72 scale. The kit includes 2 complete Raiders, each of which has 11 parts, and 2 clear bases that consist of 2 parts each. Each ship and base is on its own individual sprue, which makes finding the parts, and keeping them separated easy. I was happy to see that all of the panel lines are recessed rather than raised. No decals are included, or needed, with this kit. Although these kits are a smaller scale, they are highly detailed, and the smaller scale would make them perfect for a diorama with the 1/72 scale Vipers, also produced by Moebius. Having 2 complete kits opens up several possibilities, including building different variations of the ship, building with a child or spouse, or maybe just keeping one as a backup in case something goes wrong with the first one. The kit is very well engineered, and dry fitting the parts indicated that there would be very few problems with construction. Once I started gluing parts, I had the entire ship together in under an hour. The only part I had any difficulty with, which was very minor, was the Central Lower Fuselage. It didn't want to stay flush to the surface of the main assembly, but putting clamps on the part and letting it dry for a couple hours fixed the problem. At this point, there were no major gaps in the seams, and the ship closed up pretty tightly. The few seams that are visible are on the bottom of the ship. I could have easily started painting at this point and been very pleased with the finished product. Since I am a nitpicker, I eliminated the seams by using a fine liquid filler (Mr. Surfacer), followed by a little sanding, and some very minor re-scribing of the panel lines I had sanded over. In hindsight, I should have eliminated the seams around the inside of the wings before attaching the Central Lower Fuselage, since the guns make it difficult to sand some areas. It can be done after full assembly with a little effort, but as I was sanding those hard to reach areas, I was wishing I had done this first. There is a very fine textured pattern on the ship. I was afraid that my sanding might create some problems, but as the pattern is difficult to see without high magnification, it didn't appear to make a difference. The box art shows the ship painted entirely in silver except for the thrusters and engines. Following this scheme would provide a beautiful piece without a large time commitment. This sort of paint job would be great for a beginner, could be achieved with a rattle can and minor brush work, or provide practice for getting an even silver finish with an airbrush. I wanted to go a little more in depth with my paint scheme, so I did research by scanning through a few episodes on DVD. It appeared not all Raiders looked exactly the same. Many flew by the screen too quickly to see details and were a blur when I paused the picture. To complicate matters, the physical props that the actors interacted with were not painted the same as the CGI models of the exact same ships! Although I did use the instructions as a loose guideline, I decided I had a little creative freedom. After using a grey automotive primer, I base coated the ship by airbrushing a mix of Tamiya Flat Aluminum and Metallic Grey. I added Tamiya Chrome and then Metallic Gray to various areas by masking the ship off with Silly Putty. I put the Silly Putty on the area I wanted to cover, and lightly ran my scribing tool in the panel lines along the Silly Putty to get a clean edge. This was a very quick and effective method. Next, I brush painted the engines and thrusters with Vallejo rust, used Blackheart Enterprises grey for the stripes along the top of each wing, and black for the eye, with a dot of Vallejo red. I didn't want the ship to look too pristine, but also didn't want a lot of weathering to obscure my metallic finish. I made an acrylic pin wash of charcoal grey, and used it to enhance the panel lines and other details. After this dried, I clear coated the ship with Testors dullcoat. Getting the ship on the base was a little tricky because it is a very tight fit. It took a little carful work to get the tab of the base into the opening in the model without applying too much pressure on the ship. Once it was in place, the model was held there tightly by the pressure. 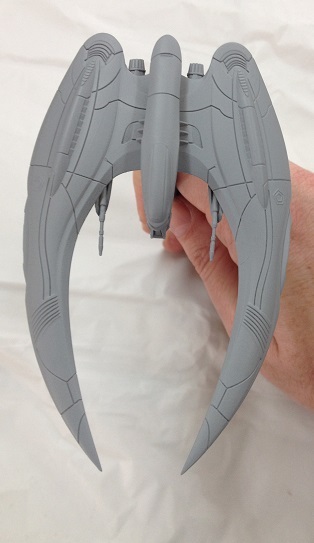 This is a very worthwhile kit for any sci-fi modeler or Battlestar Galactica fan. The ease of construction makes it an ideal kit for a novice and the inclusion of 2 full kits provides several possibilities for making the most out of this build. The ship looks great with a simple paint scheme, but the intricate details provide the opportunity to challenge a more advanced modeler. I used this kit as a side project while working on a larger project, and it was the perfect piece to keep myself busy while the other project was drying. This being the case, I took my time with it. After completing it, I believe this could easily be completed in 1-7 days of concentrated work, depending upon the level of complexity you decide to include. However you want to approach it, it is a fun build. Thanks to Moebius for providing the review sample.